Shale oil extraction projects are set to be more attractive than crude oil extraction, but only if the government implements previously promised tax reliefs. Gazprom Neft stands to gain experience in shale oil production through the development of the Bazhenov formation at the Verkhne-Salym oil deposit, which is currently operated by Sаlym Petroleum Development (SPD), a joint venture of Gazprom Neft and Shell. The companies’ specialists have developed a road map that defines the steps for achieving the main goal – the development of the Bazhenov formation on an industrial scale. “In contrast to shale gas extraction, which is absolutely irrelevant in Russia, tight oil production is of considerable interest for Gazprom Group, and we will work actively on this issue,” said chairman of the board at Gazprom Neft, Gazprom CEO Alexey Miller. This statement followed an order that President Vladimir Putin gave to Gazprom in late October. The matter should revise the key principles of the export gas policy, taking into account the development of shale and liquefied gas production. In 2011, the volume of shale gas production in the United States grew to 7.5 trillion cubic feet. “In cooperation with our international partners, we must take full account of the current trends on the global gas market, find new mutually acceptable forms of cooperation, be closer to the end users,” said Putin. All shale oil projects in Russia (implemented by TNK-BP, Lukoil, Rosneft and Surgutneftegas) remain at very initial stages, and the economic efficiency of their development on an industrial scale has yet not been proven, says Capital Investment Finance House analyst Vitaly Kryukov. Shale oil wells may cost four times more than traditional wells, and the flow rates of these wells are known to decrease during the first years of exploitation. Thus, it requires serious technological solutions to maintain production, Kryukov says. According to him, it will not be possible to simply transfer to Russia the experience of U.S. companies that are actively increasing oil shale production. The geology of such projects is heterogeneous and considerably dependent on the regions themselves; their development has not even been profitable until now. 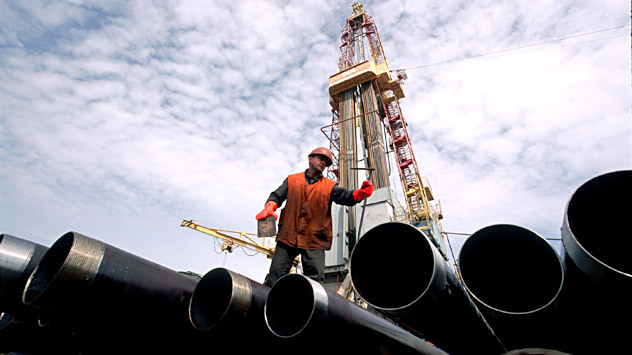 The interest of Gazprom Neft in such projects can be explained by tax reliefs offered by the government for tight oil. According to estimates of UBS analyst Konstantin Cherepanov, these tax reliefs make shale oil production more profitable, in contrast to crude oil. At the present price of $100 per barrel, and under the current tax regime, crude oil extraction brings, on average, $5 of free cash flow. On the other hand, under new tax reliefs (zero percent of the mineral extraction tax and 10 percent tight oil tax of the crude oil export) tight oil production would bring $35-40 of free cash flow. Despite additional extraction expenses, Cherepanov believes that this would considerably improve the company’s economy.